Dissolved boron in the oceans is present primarily as B(OH)3 and B(OH)4-, and these two species differ in the ratio 11B /10B. Field obser vations and experimental studies have suggested that the uptake of boron into biogenic calcium carbonate records the isotopic composition of B(OH)4- with little isotopic fractionation (Hemming and Hanson, 1992; Sanyal et al., 1996). Because the relative proportions of the two dissolved boron species vary with pH, and the degree of isotopic fractionation between the two species is known, the 11B/10B of B(OH)4- also varies with pH (Hemming and Hanson, 1992; Sanyal et al., 1996). 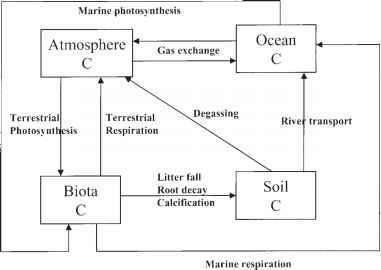 If the boron incorporated into calcareous organisms faithfully records the isotopic composition of B(OH)4- in seawater, it is possible to calculate the value of pH for ancient oceans by determining the 11B /10B of fossil organisms (Hemming and Hanson, 1992; Sanyal et al., 1995, 1996; Palmer et al., 1998; Pearson and Palmer, 1999, 2000). From paleo-pH, making certain assumptions about the concentration of dissolved inorganic carbon (DIC) in seawater, it is possible to calculate paleo-atmospheric CO2 from paleo-pH. This is the basis for the boron isotopic method for estimating paleo-CO2. There are problems, however, with this method. First, the fraction-ation of boron isotopes is a function of temperature and this requires an estimate of the water temperature where the calcareous organism actually lived. (This factor can be helpful in deducing the depth distribution of paleo-pH when applied to planktonic foraminifera that are known to live at different temperatures at different water depths; Pearson and Palmer, 1999). Second, it is assumed that only B(OH)4- is taken up in the carbonate which, on the basis of the crystal structure of calcite and aragonite, is difficult to explain. Third, it is assumed that there is no fractionation (Hemming and Hanson, 1992; Palmer et al., 1998) or a known constant degree of fractionation for a given organism (Sanyal et al., 1996) during uptake of B(OH)4-. This has been challenged by Vengosh et al. (1991) and by M. Pagani (personal communication). Fourth, the isotopic composition of total boron in seawater is assumed constant over time, which is justified for periods much shorter than the mean residence time of boron in seawater (18 million years), but not for the Tertiary (Lemarchand et al., 2000). Finally, there is the problem of converting paleo-pH to paleo-CO2. This requires knowledge of the DIC of paleo-seawater, which is not known and must be estimated. As CO2 changes over millions of years, the concentration of DIC must also change (Caldeira and Berner, 1999). Pearson and Palmer (1999, 2000) have estimated CO2 levels ranging from the Paleocene to the Pliocene, using the boron isotopic method applied to planktonic foaminfera. Their results are also shown in figure 5.20, along with results for GEOCARB modeling, the stomatal index method, and the planktonic carbon isotope fractionation method. Strong disagreement between the boron isotope method and the other methods are obvious for the Eocene (55-34 Ma), but not for the Miocene (245 Ma). Overall, as pointed out earlier, there is general agreement for all methods of decreasing CO2 during the past 65 million years. What are isotopes of Boron?